The Dollar/Yen pair drops and tests the 112.00 level as the greenback's correction continues. The greenback continued its drop on Wednesday after hitting a seven week high on Tuesday. We believe that the weakness in the U.S Dollar is attributed to investors expecting the Federal Reserve to alter their hawkish stance of increasing interest rates at such a fast rate. Investors - along President Trump - seem to believe that inflation has not risen out of control to explain an ultra hawkish Fed. For today, the market is expecting the release of the U.S CPI figure, a worse than expected figure will mean that the Federal Reserve will most likely change their hawkish stance and lead to a further drop in the U.S Dollar. 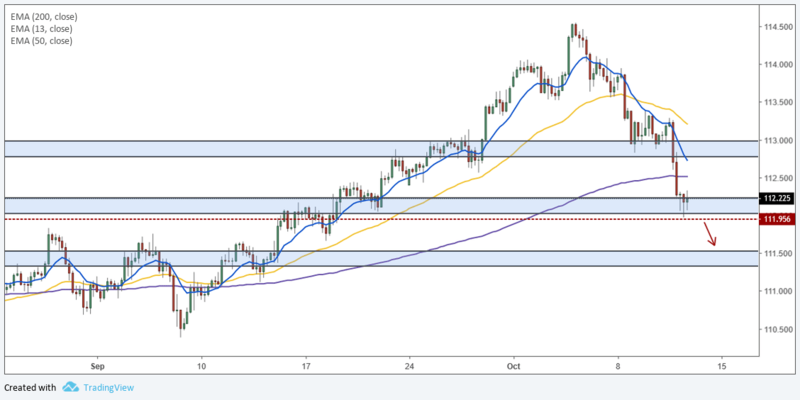 The pair broke down below the 112.833 level and dropped all the way towards the 112.206 support level. During its drop, the Dollar/Yen pair managed to break below the key 200-period moving average signaling a possible shift in the long term trend of the pair. Momentum is moderately bearish at the moment with prices trading below all three major moving averages. Bearish momentum will strengthen when the 13-period moving average crosses below the 200-period moving average. This cross will trigger a break below the 111.956 support level paving the way for a drop towards the next support at 111.532.